Esoteric Testing Market size is set to exceed USD 35 billion by 2024; according to a new research report by Global Market Insights. Increasing prevalence of chronic diseases and infectious diseases in developing countries such as China along with rising geriatric population, highly susceptible to suffer from chronic disorders will drive esoteric testing market over the forecast timeframe. Rising number of people suffering from rare diseases has escalated burden on healthcare systems to develop innovative test solutions, thereby fueling industry growth. Furthermore, sophistication of laboratory equipment leading to growing adoption of ground breaking technologies such as flow cytometry, mass spectrometry and real time-PCR will favor industry growth. Growing awareness about early disease detection along with rising demand for genomics and proteomic will positively impact esoteric testing market growth over the forecast period. However, lack of trained professionals and stringent regulations related with esoteric tests will restrain industry growth in future. Infectious disease business segment dominated the esoteric testing market in 2017 with around 28% market share followed by endocrinology, anticipated to witness considerable growth over the coming years. Rising incidences of infectious diseases coupled with growing demand for advanced molecular tests for identifying rare molecules present in the body will drive segment growth. Rising awareness about pre-disease diagnosis and treatment will further stimulate demand for esoteric tests over the coming years. RT-PCR business segment of esoteric testing market is estimated to witness around 9.6% CAGR growth over the forecast period. Growing adoption and application of real-time PCR as compared to other conventional techniques due to its superior specificity, sensitivity and speed with reduced contamination risk will drive segment growth. Technological advancements in field of PCR coupled with growing investments towards PCR-based research will further propel business growth. Germany esoteric testing market should grow with more than 8.5% CAGR growth rate owing to increasing incidences of rare and complex diseases and high cutting edge technological adoption. Germany has well developed National Rare Disease Plan with centralized core programs for neonatal screening, national funding, access to treatments, robust research plans, coordinated networks and cross-border collaborations for rare diseases should propel industry growth. Developing healthcare infrastructure, growing awareness about early disease detection and numerous initiatives undertaken by government will drive Indian esoteric testing market. Initiatives such as action plan to eradicate Visceral leishmaniasis (VL) by 2017 undertaken by government will fuel industry growth. Furthermore, increasing elderly population in the country will stimulate demand for esoteric tests over the coming years. 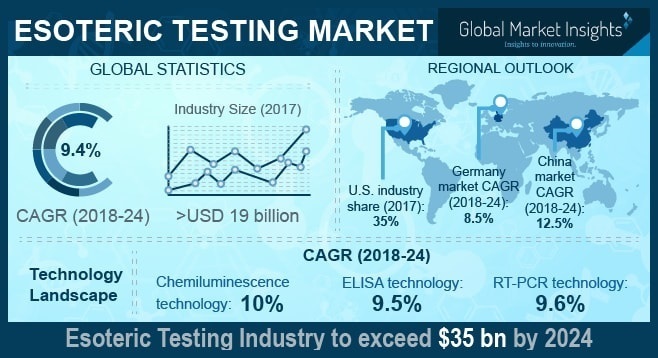 Some of the key industry players operating in global esoteric testing market are Laboratory Corporation of America, Quest Diagnostics, Opko Health, and Arup Laboratories. Other players include Mayo Medical Laboratories, ACM Global Laboratories, American Esoteric Laboratories (AEL), Fulgent Genetics, Invitae, Myriad Genetics, Nordic Laboratories, Miraca Holdings, Genomic Health, BioMONTR. The industry players are focusing towards elevating their market position by adopting various inorganic growth strategies such as acquisition and strategic partnership. For instance, Opko Health acquired Bio-Reference Laboratory, third largest clinical laboratory in August 2015 to expand company’s product portfolio, thereby consolidating market position.